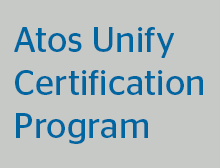 The Unify Certification Program goes hand-in-hand with the Unify Partner Program which gives you better business opportunities, better discounts and better perspectives. The Unify Academy supports you in obtaining and expanding the qualifications necessary for a successful business partnership with Unify. To achieve this, we have an extensive portfolio of training and certification available. You can access the career paths by following the subheading under Certification Program on the left. There you can also request your "Candidate ID". View the "Channel Partner Ordering Tutorial"
After completion of the individual learning module (pre-requisite! ), the participant can start immediately with the related exam. If a participant doesn't pass the exam after the first attempt, the test can be repeated up to three times. Please finish the exam module in one operation, since the start is limited to a total of four times. Afterwards the access to this test is closed for one week. The attendee has to send an email to certification@unify.com to be released again for the examination.